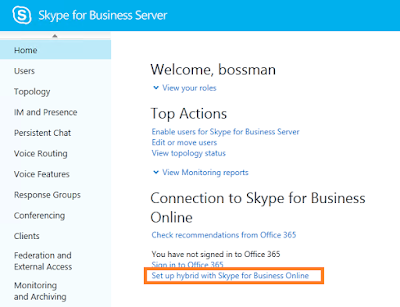 In an earlier post, Configure Hybrid In Your Skype for Business Environment, I discussed the pre-requisites for setting up a Hybrid environment, and then walked through the configuration via PowerShell. 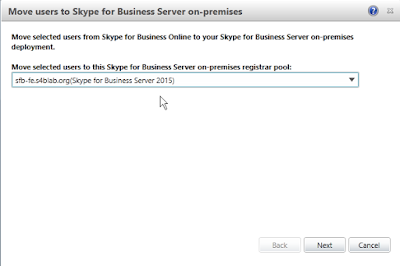 In this post I will be demonstrating the Hybrid configuration and moving of users between environments all from the GUI within the Skype for Business Control Panel. To view details about the environment and the needed pre-reqs, please visit the blog post referenced above. 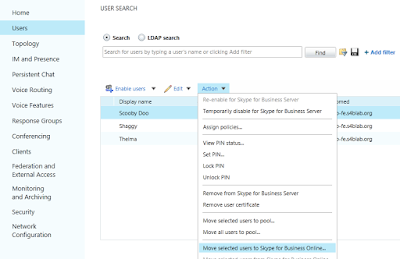 Assuming that you have already satisfied all the pre-requisites per the blog post mentioned above, it is now time to connect your environments using the provided wizard in the Skype for Business Control Panel (on-premises). 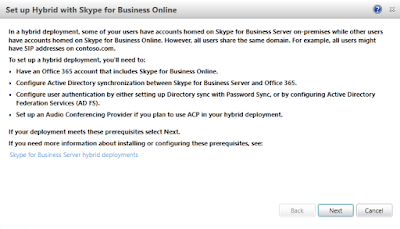 The Set up Hybrid with Skype for Business Online wizard will open, and the first screen simply presents a list of pre-requisites that must be satisfied. Click Next. 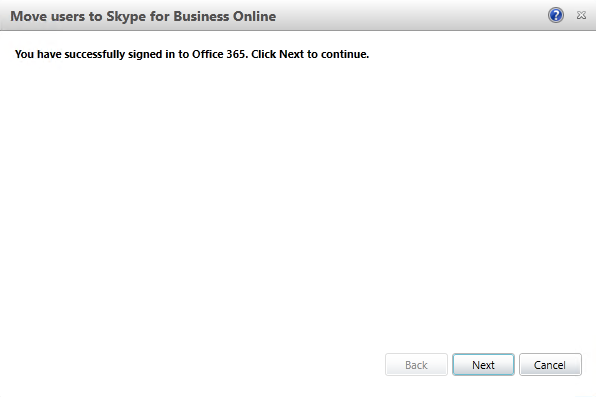 The next screen will likely prompt you to sign in to Office 365. 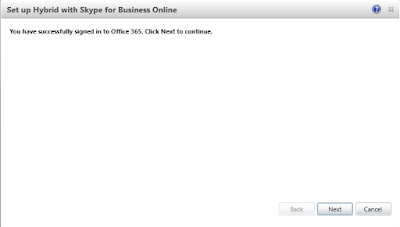 Click the Sign in to Office 365 button. 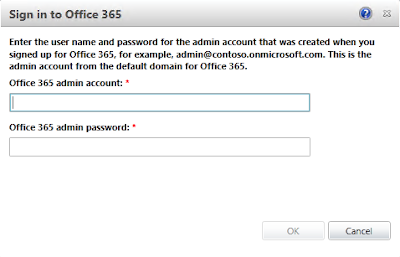 Enter your credentials, and then click Ok.
You will then see that the wizard is attempting to sign in to Office 365 with the provided credentials. The next screen will show that you are successfully signed in to Office 365 if your credentials were correct, and you can click Close. 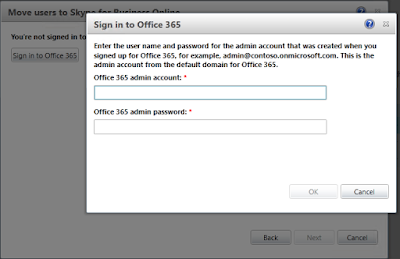 The next wizard screen seems a bit repetitive, but it confirms that you are now signed in to Office 365. Click Next. Now the wizard will actually perform a check to see if the pre-requisites have been satisfied. If any checks come back with an "X" in a red circle, no problem. 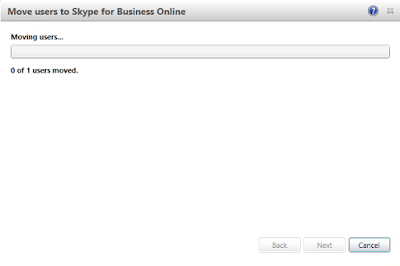 Just click Next, and the wizard will take care of the needed configuration. 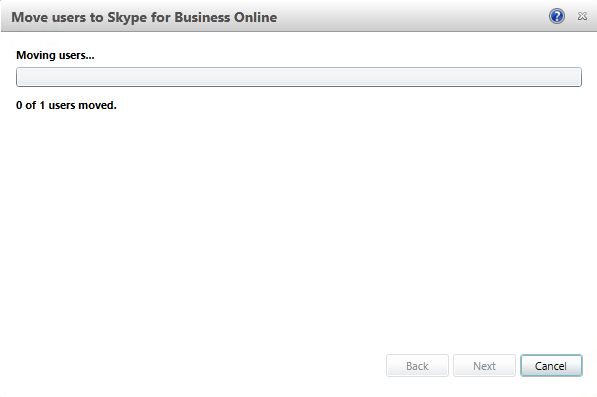 As you can see, all pre-requisites were taken care of. 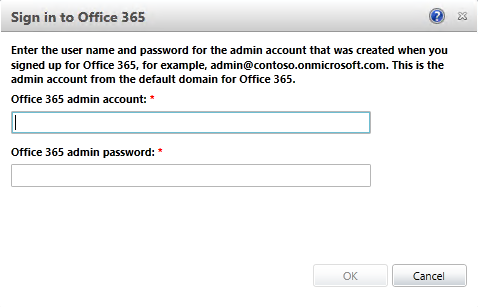 The image below reflects that the "Federation with Office 365 is not configured" error in the above image was automatically configured for you. Click Close. Wasn't that easy? 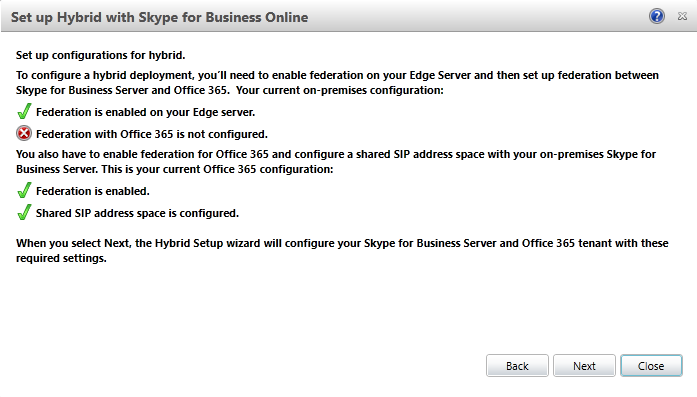 Hybrid is now configured! 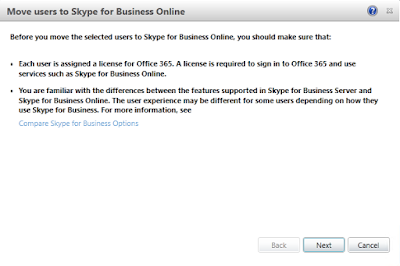 The Move users to Skype for Business Online wizard opens, and you are presented with a warning to make sure that the user has a Skype for Business Online license assigned in Office 365, and with another warning to make sure that you are familiar with the feature differences between environments. 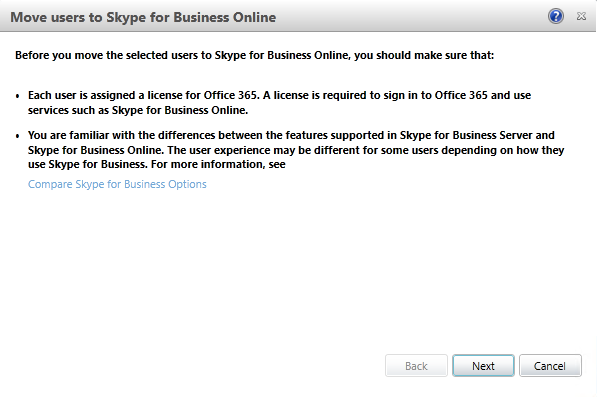 (NOTE: if you need to assign a license to the user in Skype for Business Online at this point, stop and do so. 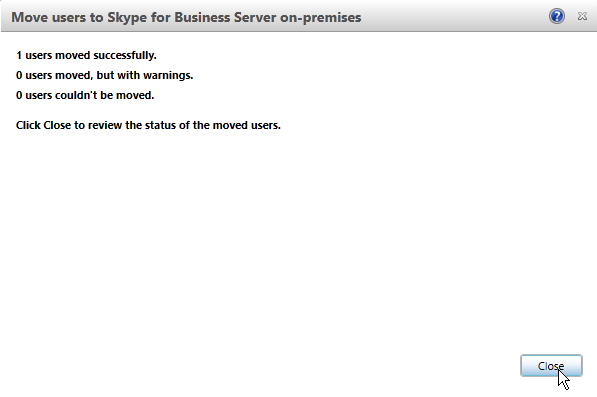 Then go grab a coffee from Starbucks; I have seen provisioning take between 30 - 60 minutes for this license assignment to be recognized from the Control Panel.) Click Next. 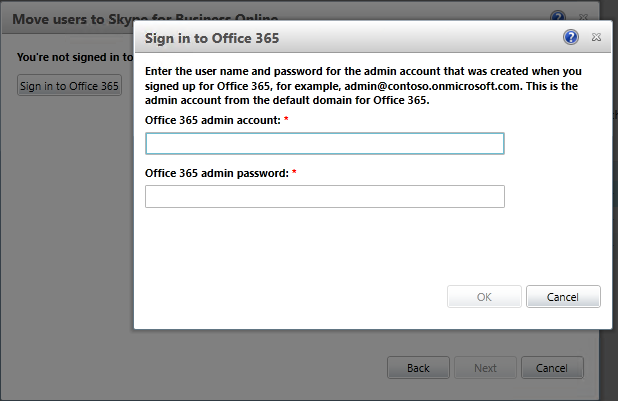 Again, you may be prompted to sign in to Office 365. 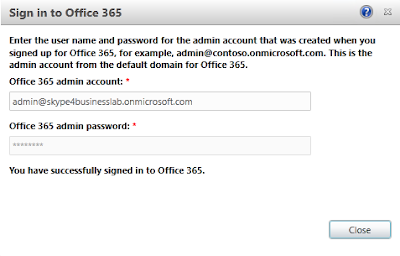 If so, enter your credentials, and click Ok. Once you are signed in, click Close. Repetition. 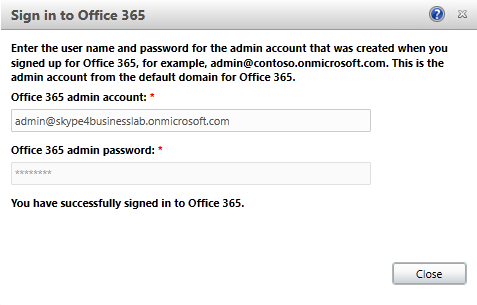 More confirmation that you are signed in to Office 365. Click Next. 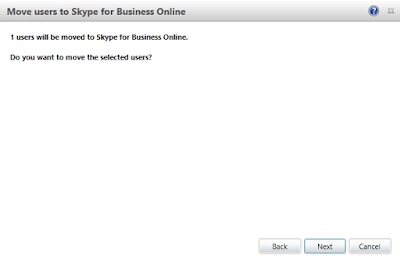 You are now presented with another prompt asking if you are sure you want to move this user to Skype for Business Online. Click Next. Next, a screen appears displaying the progress of the move operation. 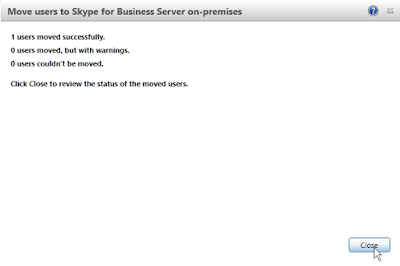 Once the move completes successfully, you will see the below screen. 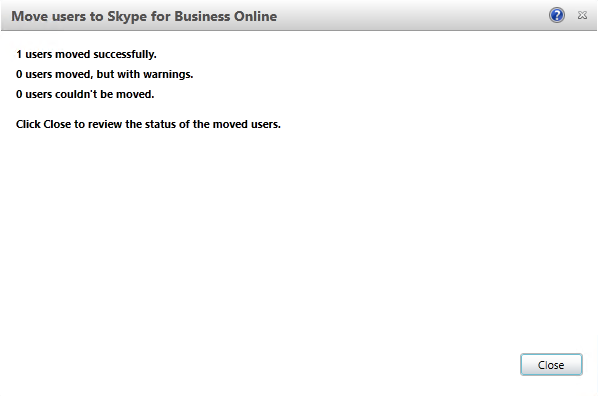 This would show if the move was unsuccessful for any reason (like licensing not being recognized yet). 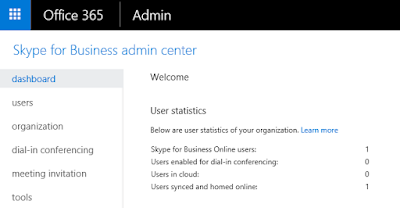 This report can be more helpful in cases where you are moving multiple users. Click Close. 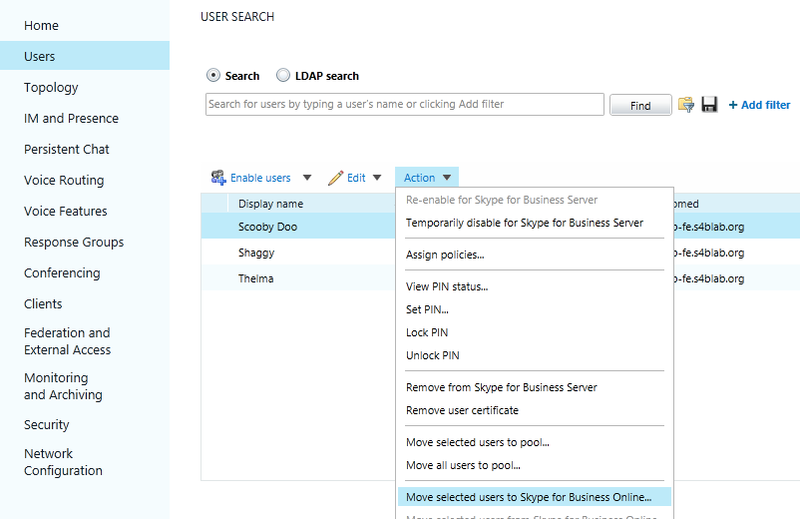 Now, if you look at your users in the Control Panel, you can see that Shaggy and Thelma are still homed in the on-prem pool, but Scooby is now in Skype for Business Online. Clicking on the Users tab in the Skype for Business Admin Center further confirms that Scooby is now indeed Online. 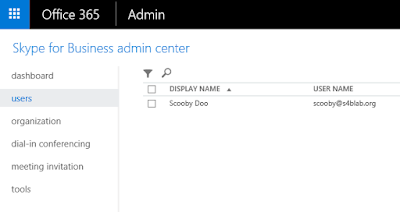 Back in the on-prem Control Panel, if we open the Properties of Scooby, and read the message, it hits the point home just a bit further that he is definitely homed in Office 365. Alright, so you have moved a user to Online. Before they get too comfy, let's move them back to on-prem! 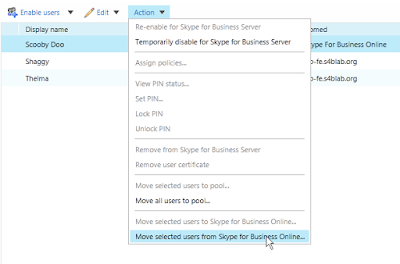 In the Move users to Skype for Business Server on-premises wizard, you are prompted to select the pool that you want to move the user to. 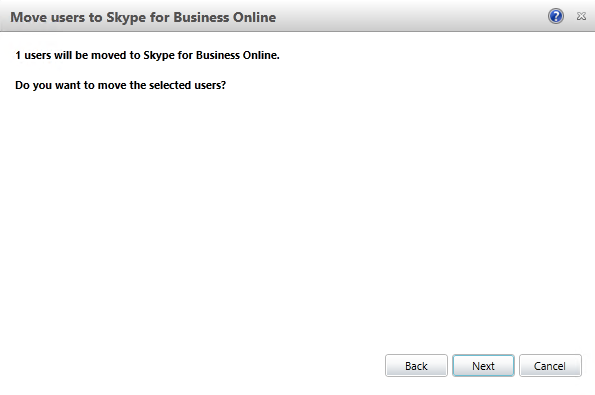 Make your selection from the drop-down box, and then click Next. 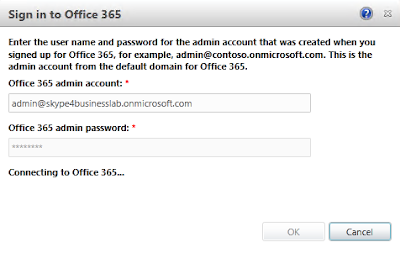 This operation requires you to connect to Office 365 once again, so click the Sign in to Office 365 button, enter your credentials, click Ok, and then once you are signed in, click Close. 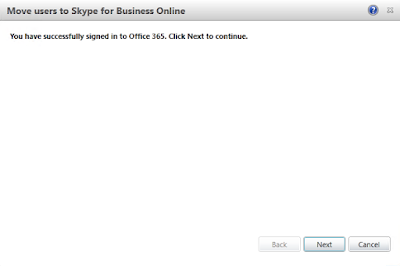 You will receive the expected confirmation window stating that you are now signed into Office 365 as was demonstrated above. Click Next. 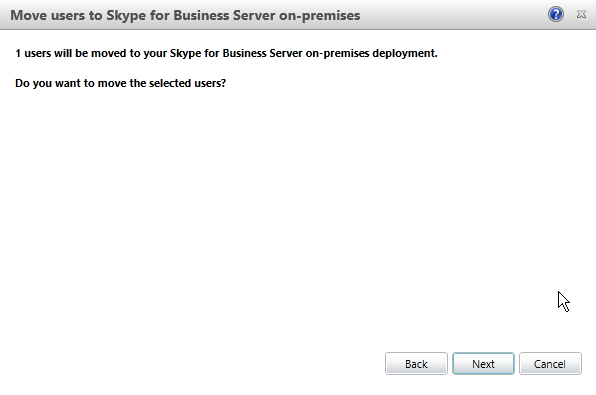 The next screen is asking you to confirm that you want to move this user to your on-prem pool. Click Next. Again, you are presented with the progress of the move operation. 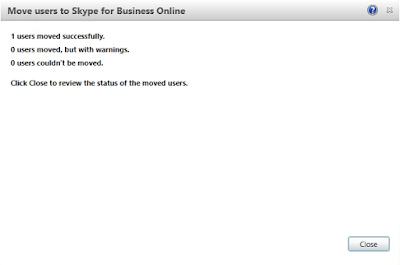 Lastly, you will see the results screen. In our case, you can see that Scooby moved back successfully. Click Close. 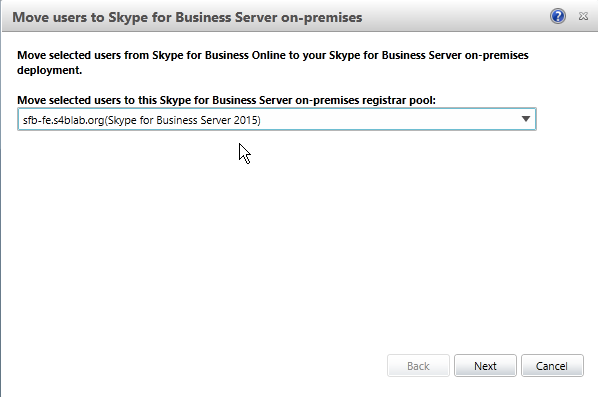 Now, if we take another look at all of our users, we can see that they are all back nice and snug in our on-prem pool. And that's it! 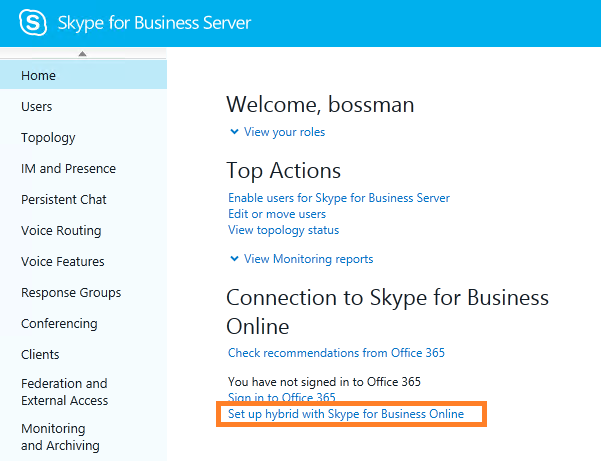 Once your pre-reqs are in place and Directory Synchronization is working, configuring Hybrid and moving users between environments is very simple and straightforward from the Skype for Business Control Panel. Thanks for your post very interesting. 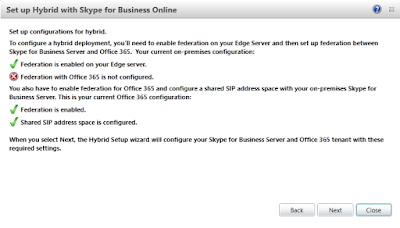 I'm in a process of doing a Hybrid installation but when I want to sign in to Office 365 in S4B Console, I get error message: "The Skype for Business Online Connector module isn't installed. 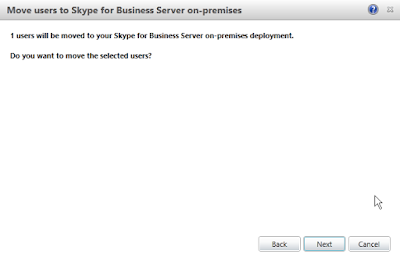 Please install it on all Front End Server". 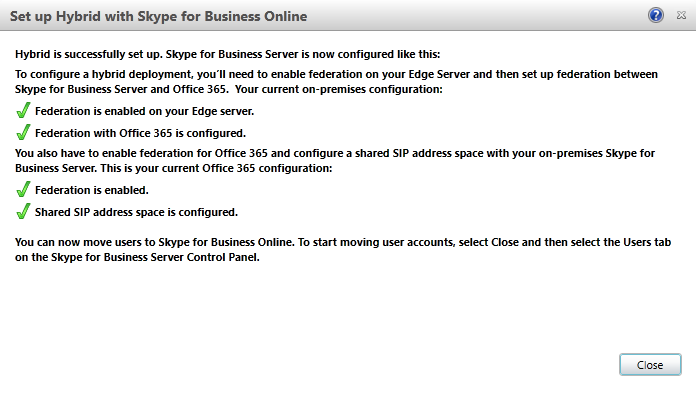 S4B Online Connector is installed. 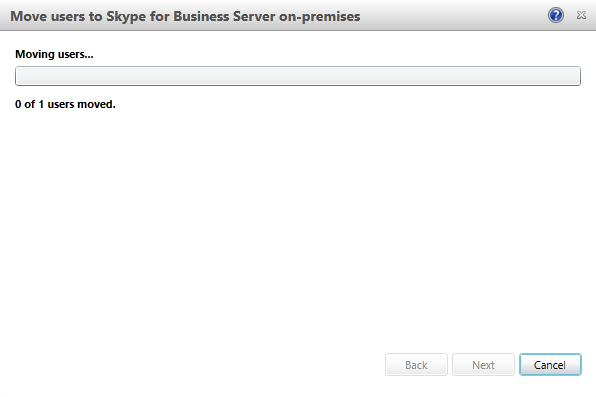 I've uninstalled it and reinstalled it, restarted the FE server without success. 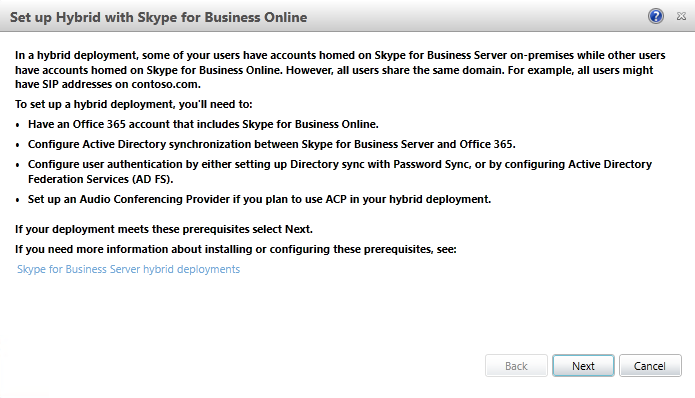 “Skype for Business Online, Windows PowerShell Module” is listed in “Program and Features”. 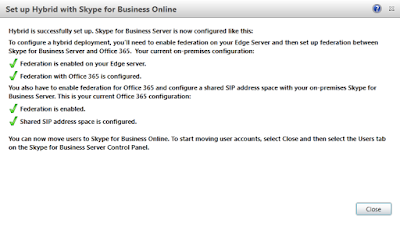 I’m was able to connect in PS to S4B Online to run “Set-CsTenantFederationConfiguration -SharedSipAddressSpace $true” without problem. Server is update to date with no Windows or S4B updates. Hello Sebastien, and thanks for reading! That is an interesting problem indeed, and the first time I have heard of it. 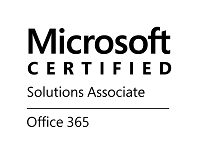 Is your installed PowerShell module the same version as the one in this download link: https://www.microsoft.com/en-us/download/details.aspx?id=39366? Also, is this a single FE deployment, or is it a pool (or multiple pools)? 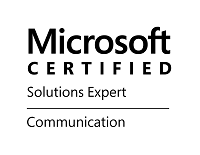 I believe the Connector has to be installed on all FEs in your deployment. 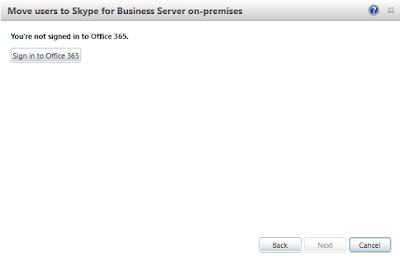 I wish I had a more in-depth suggestion to shell out at the moment, but this is a completely new issue to me. 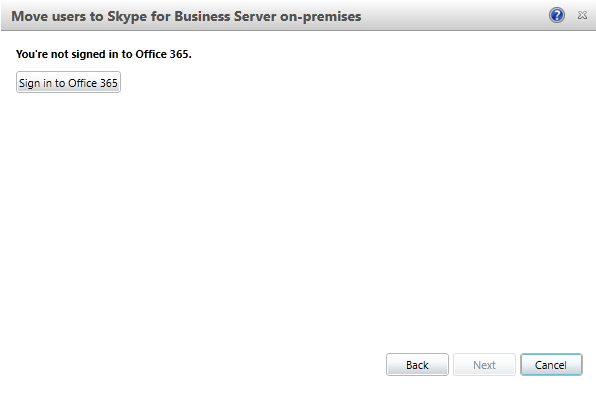 I have the same issue and cant get this resolved I also open a ticket at Microsoft and they was not able to support as well . this was working for few weeks but than stopped unexpected. 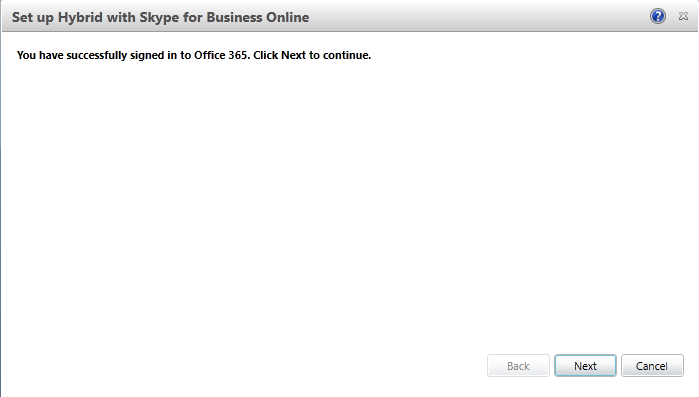 Would like to know if you found a solution ? Hard to explain. Tried it the next day and it worked! Be sure you have the latest CU and try it back! 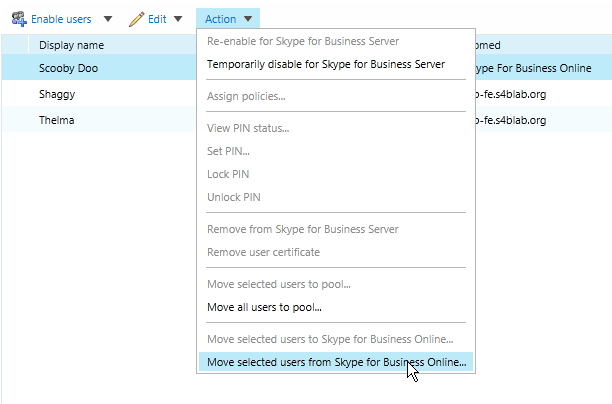 I already done that the only way to migrate is via PowerShell but I have Helpdesk team that don't have the skills to run shell script therefore I prefer it via the GUI. let me know if you have any new idea .